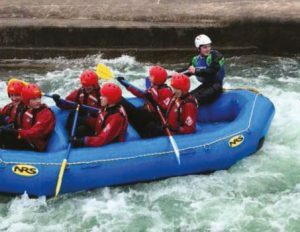 A group of 40 Company aged young people from 6 Companies in Wales went Whitewater rafting in Cardiff Bay. A nice early spring day was what we hoped for but unfortunately the beast from the east returned and temperatures plummeted, snow began to fall, with leaders and parents nicely tucked up in the café enjoying a cuppa watching the action out on the water. The weather did not get in the way of what was a fantastic morning. Lots of laughter was had as they took on the challenge, it was a great chance for Companies to meet and work together as a team, encouraging each other along the way. After plenty of fun out on the water and a little swim back to land for some of the young people, it was time to head indoors to dry off and warm up.